Dale Steyn is the No 1 fast bowler in world test cricket. This article gives you complete information about South African cricketer, Dale Steyn. Biography and profile of Steyn is included in this article. More details about Career performance of Dale Steyn is also quoted in this article. The full name of Dale Steyn is Dale Willem Steyn. 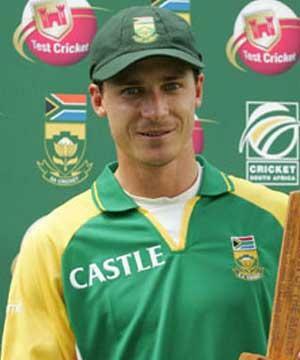 Steyn was born in the year 1983 June 27 at Phalaborwa, Transvaal Province, South Africa. Dale Steyn is one of the best fast bowler in all forms of cricket. Steyn is currently the No 1 bowler in ICC world test rankings. Dale Steyn started his International cricket career in test cricket in the year 2004 December 17 against England. His one day debut was against Asia X1 in the year 2005 August 17. Dale Steyn is also playing for Deccan chargers - IPL team. Steyn took his first test wicket of Marcus Trescothick in 2004. Dale Steyn made his first best performance in 2006 where he took first five wickets hold against New Zealand. He takes total of 16 wickets in that series against New Zealand. Dale Steyn had taken 238 wickets in test cricket and 81 wickets in one-day cricket. His T20 debut was against New Zealand in 2007 November 23 and IPL debut in April 28 2008. Dale Steyn took his 200th test wicket in the year 2010. Steyn had taken 5-wicket hold in Test cricket for 16 times and ten wickets hold in 4 times. He got 3 man of the match and 3 man of the series awards in Test cricket. This article will help you to get complete information about Hashim Amla, one of the consistent and best batsman in south African cricket team. Profile, Biography and career records of Hashim Amla are the main topics included in this article. This article gives complete information about Jacques Kallis who is the No 1 test batsman in the world. This article gives you details about Biography and profile of Jacques Kallis. Details about Career performance of Jacques Kallis is also quoted in this article. Charl Langeveldt is one of the pace bowler from South Africa who is very talented and skillful, but doesn't have a long run in International cricket due to long list of good bowlers in the country. Langeveldt is now in late 30s and had already palyed in all three format of the game for country. Here is detailed information about this player. Allan Donald when launched to international cricket, he took five wickets in his first ever international match against India in an ODI at Kolkata. From their he did not only troubled Indian batsman but England, New Zealand and West Indies all teams surrendered against his excellent bowling. Here is complete information regarding this south african cricketer.